Yes, of course you are! You lucky dog! "Everybody plays the fool, sometimes. There's no exception to the rule." Playing the fool is part of our common humanity, part of what it is to be human. Like so many things, it's not personal. It is part of the human experience. 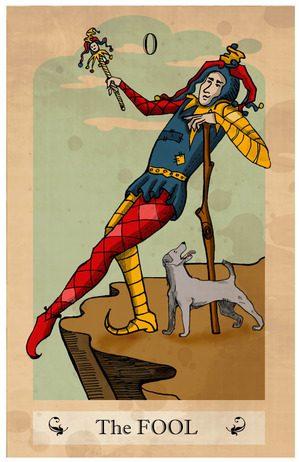 The power and wisdom of the fool experience is elucidated through Carl Jung's explanation of archetypes, specifically the Trickster. Jung defined archetypes as the potential or blueprinted energies which lie dormant in everyone; they're in our energetic DNA- in All of us, and sometimes they get activated. When this occurs, it's almost as if you were being danced through a well rehearsed routine. The Trickster archetype moves in mischief, jokes and pranks. She can be found on obvious celebrations of her energy, like today, April Fools, but she is often present in less obvious or convenient times. She is not malicious, but her actions often point to or result in bringing awareness to her own or other people's hidden stupidity, shams and even falsehoods. The Trickster points out the flaws, the holes in infrastructures, society and even rebels against false authority. Most importantly, the fool-hearted Trickster signifies transformation. In Mythology, the Trickster often shows up as a spirit, a man, a woman, a God, Goddess or an anthropormorphic animal. Native American cultures often utilize a Wolf. In mythological and human psychological history, the Trickster most always, both signifies & plays the role of effective therapeutic change. The story begins, the characters are introduced and things build. At some point, unexpectedly, the silly Trickster shows up and presents a seeming treasure, a prank, or even a gift. The trickster is just dancing, doing what tricksters do, playing out that role. It is often not intentional or fully known to him what he is doing or exactly why he is doing what he is doing whilst he is doing it! This is the feeling of being danced. Nevertheless, the tricksters actions eventually culminate in a great realization or fool experience for himself or another. The prank is then revealed. Toto-Trickster pulled the drapes, the formerly known Land of Oz is transformed with one silly little swish of his tail. The change brings about Truth, clarity and resurrection. If the Trickster has come into your life this April, bringing perhaps seemingly unwanted gifts or pranks, play the fool. Have Faith. Follow the yellow-brick road, allow the Cosmic joke to unfold and reveal. Everybody plays the fool, sometimes. There's no exception to the rule. Its all for the good. You are whole and You are forgiven. Did you know that trauma (PTSD) and Addiction feed each other?